Cupid is back and she's killing celebrity couples on their wedding day in an effort to destroy love in Star City. Despite their current troubles, Oliver and Felicity set themselves up as bait to bring her to justice, Meanwhile, Laurel Lance faces the fight of her legal career as she tries to find a way to deny bail to Damien Darhk without exposing Team Arrow or sacrificing her father. In the flashback sequences, Oliver and Taiana steal the soul-sucking artifact that Baron Reiter seeks while trapping themselves in a dead-end in the caves under Lian Yu. Again, we have to wonder how Laurel is allowed to handle a case where she's a known associate of most of the witnesses - particularly her father. When exploring the wedding dress storage facility, Oliver calls Cupid by the name "Carter" rather than "Cutter". This flubbed line is also in the Closed Captioning for the episode. Oliver identifies the armor that protected him from Cupid's arrow as a Kevlar vest. While Kevlar is a fine material for bullet-proof vests, it offers virtually no protection from cutting or piercing weapons. In fact, many Green Arrow comics are built around this point including the very first story-arc of Mike Grell's Green Arrow title! As usual, the chemistry between Stephen Amell and Emily Bett Rickards is fantastic and the final scene is truly heartbreaking. Paul Blackthorne's performance as Quentin Lance on the stand is masterful. While the stunt-work and fight choreography for this episode is limited, what little there is proves amazing. When the episode opens, the usual green arrowhead in the show logo is replaced with one of the red heart-shaped arrowheads that tip Cupid's arrows. At his trial, Damien Darkh claims to be Kenneth Bender - a citizen of Markovia. Markovia is a fictional European nation in the DC Universe - home to the superhero GeoForce. Felicity determines that the sleeve of Cupid's costume contains fibers from at least sixty different kinds of white silk lace - i.e wedding dress fabric. There are also traces of acid-free polypropylene - a chemical used in treating fabrics in long-term storage. Cupid: Love is a bullet in the brain or an arrow to the heart. Felicity: It's fine. Which is universal code for "I don't want to talk about it." Baron Reiter: The difference between insanity and belief lies only in the number of believers. Quentin: I don't care about immunity. Laurel: But I do. Dad, I'm not gonna let you incriminate yourself. Quentin: You wouldn't be doing anything. It would be me. And it would be right. I'm the one that got into bed with Darhk. I made those decisions. I should pay the consequences for them, honey. And listen, it's the only way to bring him down. Laurel: (sighing softly) Okay. Okay. If we do this, you will also testify that you acted under duress. That Damien threatened my life. Quentin: Yeah. Cause that way I get to say, on record, how much I love my baby girl. Quentin: You know, the fact of the matter is I've seen your client in his little hidey-hole. With his little men - Ghosts he calls them. And I've heard him say, repeatedly, how he wanted to destroy this city. And that if I didn't help him do it, then he'd kill my daughter. By saying all these things, I'm setting a match to my career. Maybe my life. So why would I be doing that if everything I'm saying isn't true? Oliver: Felicity...Before I met you, I had a plan. I had a way I was gonna be. Then you walked into my life. Or I... I showed up in your cubicle and... you changed everything. I was in darkness. But with your kindness, your generosity, your compassion, your intelligence, your wit and your trust... you brought me into the light. You let me know that I deserved it. You were that light. And I don't know if I still deserve that trust. If I deserve you. But whatever has happened. Whatever will happen? The way that you make me feel is the best part of my life. You can ask me to say that I don't love you... but I will never lie to you again. You are my always. And I just want the chance to be yours. Oliver: Kevlar. Under the tux. My bodyguard insisted. Cupid: What was his plan for C-4? Diggle: That's a damn good question. Felicity: From the moment he walked into my life, everything changed. I became a person that I didn't even know I was capable of becoming. I became the very best version of myself. That would never have been possible without our love. Our love gives my life meaning. It gives my life purpose. And it... brings us more joy than you can ever take away from us. And it's worth living for. All of it. Oliver: I want you to know that what I said today? During the ceremony? I meant every single word of it. Felicity: I love you. (she takes his hand and squeezes it) With everything in me. But what I said doesn't apply to us. I can't be with you. I can't marry you. Oliver: Yes you can. Yes you can, because that's what both of us want. You know, things can be different. I can be different! And I am promising you - I am swearing to you - there will be no more lies. Felicity: I do know that! And you know that! That's this life. (sighs) I'm sorry. You know, five months ago I convinced you that we could have it all. We could come here to this job and have each other. I was wrong. And then I thought we could just go back to the way things were before Ivytown. But, God, I was as crazy as Cupid. Oliver: (pauses) So what does that mean? Felicity: It means that it is too hard,to be here with you every night and not be with you. That's not fair to either of us. You told me how you worked some tech magic to return all the money that Adam Hunt swindled out of people. You... you don't need me. You're fine. (pauses) You don't give up. That's what makes you a hero. But there's no fixing this. We have to let each other go. Felicity: I want you to keep it for good this time. Please. Oliver: I don't want to let you go. Felicity: I don't want to let you go. But I'm already gone. Cupid was last seen in Episode 317. We find out that Amanda Waller kept her word regarding the Task Force X members being released in exchange for completing a set number of missions and that Cupid was released at some point within the last year. Cupid's repeated catch-phrase in this episode - "Love is a bullet in the brain" - was said by Deadshot in Episode 317. Felicity moves out of Oliver's apartment. Baron Reiter was original part of a small African village in a nation whose name changed a dozen times in his lifetime. He saw it destroyed by soldiers and vowed never to feel weak again. Oliver has the pieces of Darhk's idol. Darhk's attorney somehow found out about Diggle buying drugs on Thea's behalf back in 404 as part of a Team Arrow sting to trap some corrupt cops. Cupid is apparently an atheist, saying that the afterlife is eternal nothingness. Cupid fails to recognize Green Arrow and Arrow as the same man. Quentin is suspended from the SCPD pending an IAB investigation. The officer who informs him of this is Lt. Frank Pike, last seen in 319. Felicity refers to the hacking Oliver did to rob from Adam Hunt in The Pilot. 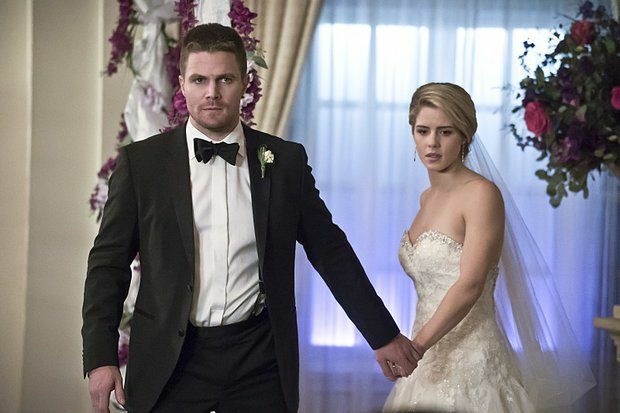 Felicity refuses to get back together with Ollie and quits Team Arrow. Damien Darhk is imprisoned with some kind of ring hidden in his mouth. A powerful and painful episode to watch for all the right reasons. When Arrow finally ends its run, this may easily be one of the Top 10 episodes. Maybe Top 5.